The CH7016A is a Display Controller device which accepts a digital graphics input signal, and encodes and transmits data through a 10-bit high speed DAC. The device is able to encode the video signals and generate synchronization signals for NTSC and PAL TV standards (SDTV), as well as analog HDTV interface standards and graphics standards up to UXGA. The device accepts data over one 12-bit wide variable voltage data port which supports 5 different data formats including RGB and YCrCb. 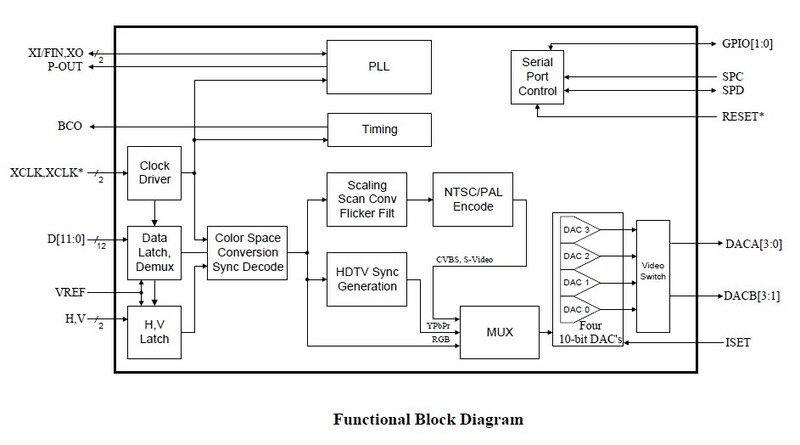 The TV-Out processor will perform non-interlace to interlace conversion with scaling and flicker filter, and encode data into any of the NTSC or PAL video standards. The scaling and flicker filter is adaptive and programmable to enable superior text display. Eight graphics resolutions are supported up to 1024 by 768 with full vertical and horizontal under-scan capability in all modes. A high accuracy low jitter phase locked loop is integrated to create outstanding video quality. ITU-R BT.656 interlaced video can also be input and scan converted to non-interlaced video. In addition to TV encoder modes, bypass modes are included which perform color space conversion to HDTV standards and generate and insert HDTV sync signals, or output VGA style analog RGB for use as a CRT DAC.